1. How did you guys meet in the first place? TD: Hmmm... good question! I think the first time in person was at the OFFF festival in Barcelona (what year?). We were each performing. Was that the first time, Stephan? or was it MUTEK when you performed? I think after spending some time in barcelona we began being in contact via email over the years and increasingly becoming aware of each other's music more and more. the last couple of years we began talking about wanting to do a collaboration together.. and I think this one sort of came about accidentally, as Stephan was submitting these tracks to me for a possible finished 12k release, but then decided he wanted me to work on them and it could become the basis of our collaboration. SM: I had to check this myself, it was MUTEK 2002 when we met for the first time. Before that we where label mates on ritornell and Fallt's Invalid object series, the idea to work on a collaboration came up quiet early but then good things take their time. 2. Please tell us about the concept of this album and why you have chosen the 78 rpms as the main theme. TD: I think I will let Stephan answer this, as the whole concept was his. SM: Actually I had this long standing invitation to produce a work for 12k. In 2007 I started collecting mechanical gramophones and early 78s and by that time I was finished with my 'Radioland' project where I took shortwave radio as a live input for my computer. so I soon started using selected 78s instead, actually using the same old patch I'm working with since Frequency Lib in 2001 and entropic processes (generating audio from loudspeakers to microphones over and over again). I also have a small collection of early 1900s wax-cylinders with recordings of classical music which I transfered on a friends phonograph machine in switzerland as I dont have one myself yet. 3. How did this collaboration start and let me know the actual process in making this album. TD: Stephan can comment on his part... it is interesting because in the beginning he thought the tracks were finished, so asking me to continue them came at the very end. My idea was to add only acoustic instruments, to keep in line with the very physical, analog feel of the 78 records. I stuck to this pretty much but there are tracks of vintage synthesizer, so not all acoustic. Stephan handed me off his tracks and I would add my material to them.. In some cases I would drastically EQ his songs to make room for my own sounds and to make sure the whole thing did not get too heavy. Stephan gave me freedom to mix as I needed. after I finished I believe stephan may have some some additional edits (I forgot exactly.. he may remember).. before we considered it "Done". SM: Yes, at some point I came up with a sketch for a 12k CD. I didn't consider it finished as I thought the music was rather demure still, mainly due to the fact that those early recordings are limited to a frequency range from 700Hz - 4000MHz. so my audio sounded just as tiny and, like most of the time, I couldn't decide to touch it myself. my respect for these 'self-evolved' creatures is sometimes just too big. so I asked taylor if he wanted to finish the pieces and I love what he did, every time a new piece came in it would put a huge smile on my face! Taylor did such a wonderful job by creating additional voices, very subtle and caressing to the basic tracks. 4. Could you briefly explain what the "78 rpm records" and "wax cylinders" are? SM: (In 1886) wax-cylinders were the forebarers of records, edisons phonograph the mother of recording and (at the same time) playback devices. A cylinder spins at 128RPM while a cutting head writes signals sent into the attached horn to the cylinders wax layer. Once the recording is finished, you can simply play it back using the same head and horn, this time the other way round. Back then all the commercially available recordings had to be recorded individually until in 1895 Emil Berliner came up with the first shellack discs which kicked-off the record industry how we know it today (well, if today was 10 years ago*). 78s where more durable than cylinders and delivered a better frequency range. Playback was of course still mechanical - a needle (steel, cactus or bamboo) sitting in the groove, making a diaphragm housed in a soundbox vibrate, those vibrations will travel through the tone arm which is attached to the horn, pretty straight forward! to me the sound reproduced like that is really enchanting (and certainly not for reasons of nostalgia!) and immediate. until the advent of the microphone in 1925 78s where also recorded using horns. for 'transcriptions' I exclusively used mechanical recordings from the 1900s and early '10s. 5. 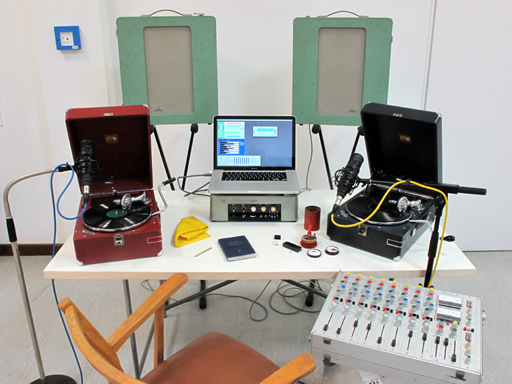 How did you record the 78 rpm records? SM: The 78s where played back on two HMV 102 portable gramophones and sent to my computer in mono using one large diaphragm microphone for each player. So basically I recorded them like you would record an acoustic instrument. The software processes were done in realtime unless for the wax-cylinders, which were pre-recorded due to not having a phonograph myself. 6. What do you think this album is different compared to your solo albums? TD: I try to make all of my projects quite differently.. and usually based upon some sort of process or approach... to work with these old 78 recordings was very special and unique.. and I think the resulting work has a much more dense feel than a lot of my own solo works which tend to be very gentle. I wouldn't call "Transcriptions" gentle, it is warm and enveloping, but coming from a more saturated point of view. SM: All I can say (again!) is that I enjoyed so much to watch the pieces grow in Taylor's hands. It is a real duet, 2 voices blending to sing one song. 7. Any other notes to add? TD: For me this was a wonderful and not too stressful way to start a working collaboration with Stephan. I really enjoy working face to face in the same studio so I think we may try something like that in the future for another collaborative work. SM: The world *is* a flat disc!